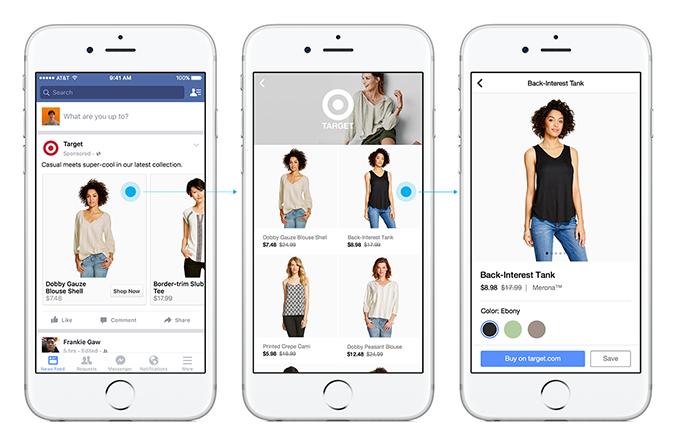 New Name, New Format for Facebook's 'Canvas' Ads — CROWD. Facebook is renaming its immersive “Canvas” ad system as part of an all around upgrade of the social media platform’s engagement options. The newly dubbed “Instant Experience” ads were first introduced in 2016 and allowed businesses to offer what are essentially mini-websites within Facebook. Instant Storefront: For all the product sellers out there, this template presents your wares in a grid format for easy shopping. Instant Lookbook: Perfect for lifestyle brands, this template allows businesses to layout their products in context so customers can picture their products in action. Instant Customer Acquisition: This template drives customer engagement with a clear call to action for visitors. Instant Storytelling: With the ability to display images and videos, this template helps businesses tell their story and give potential customers a better feel for their brand. which helps customers easily share their contact information to learn more about businesses. These eye-catching improvements are certainly going to be effective in driving viewership, especially with new integration of Facebook Pixel and other third-party pixels. that makes the customer experience easier and more appealing on both computers and mobile devices. While it still may be simpler to whip up a News Feed ad, the “Instant Experience” is a worthwhile tool for anyone looking to make a stronger impact.